Piranha may be asking a bit much with their latest sell in the free-to-play Mechwarrior Online. The new prestige item is a set of gold plated mechs. Eight of them are on sale and they’ll set you back $500 each. That’s a lot of money for a mech skin. The gold plated mechs went on sale with the Clan Collection. The collection is a set of mechs which are due for release by 17 June 2014. Unfortunately, Piranha aren’t letting you simply buy the individual mechs you want. 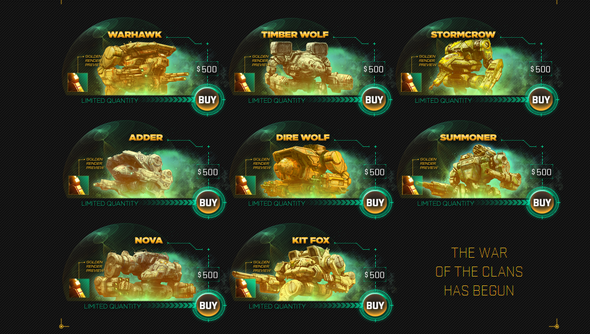 Instead, they’re offering a variety of packs which include different bundles of the mechs. These bundles range from $30 to $240. The cheaper bundles include the least popular mechs so you have to spend a lot of money to get the famous mechs like the Warhawk and Timberwolf. Except for the gold plated machines, that is. Those specialised mechs are on sale separately. So, if you wanted every clan mech and all its variants you would need to spend $240 for the top tier bundle and a further $4,000 to get each of the gold plated editions. You’re not just buying the mech skin, though. You also get a unique bonus module. The module’s being kept secret for now but if it’s anything too good then it would give those with a larger wallet an advantage over poorer players. Hopefully we’ll see a few big updates to the game between now and the mechs’ release in June. The game’s hit its full release but it’s still lacking features like the whispered about Community Warfare. If Piranha continue pushing out new mech variants instead of developing the game then they may find their audience moves elsewhere. That would be a great shame because the game of Mechwarrior Online’s core is excellent fun. Update: Due to me being uninformed and silly I originally called ‘Community Warfare’ ‘Clan Wars’, mixing up a promised feature of Mechwarrior Online for part of Battletech’s lore. I also said the Timberwolf was a variant of a Mad Cat. In fact, they’re both names for the same mech. Cheers to those who pointed this out to me in the comments.